WOW! That clutch is SO great!! Only you to combine this blue & Red and to come out such a great result!!! I really loved this, My sweet/favourite Veronica! Good luck with whatever you’re working on! I like your purse and jeans a lot. Can’t wait to hear about the new venture! great outfit!color is nice.it makes me happy. 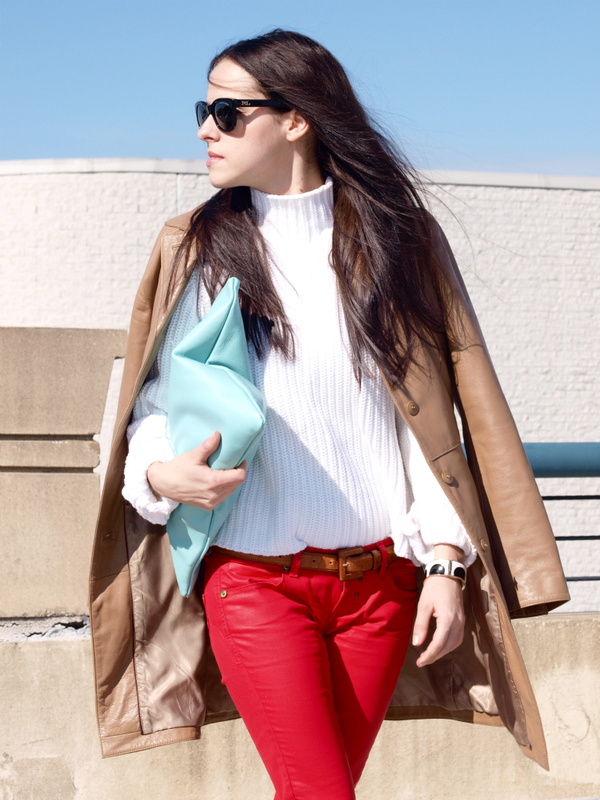 I love the mint clutch and those red pants! These colors all go together so well. I love your style! Love the waxed look of the red jeans! Cute look! I really like the contrast between your pants and the clutch! Impecable style once again! I totally love the individual elements such as the bright red skinny pants and the white knit creating a mouth-watering whole! Casual chic at its finest moment!! Bravo my darling!! youre outfit is so cute! red, white, and blue … so americano! I love your clutch and boots! Great outfit! That pastel color clutch is simply amazing. love your outfit and its colors! congrats! I accidentally mixed those two colours together sometime last summer and instantly fell in love with it. It’s so strong and modern yet has such a great tropical feel. You look stunning and perfectly styled as always. so beautiful dear!! Like you!! 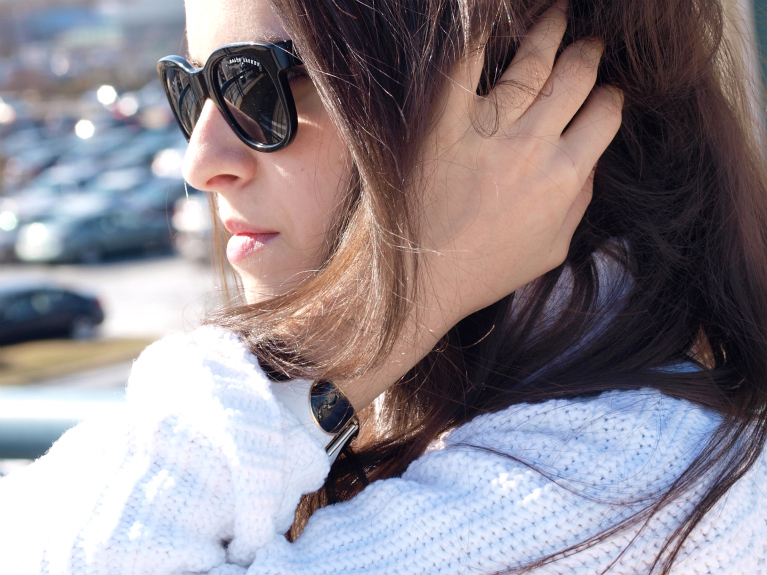 I hope that you follow me on bloglovin because i’d have GFC!! and the overall shapes just look fantastic! you truly know how to dress! red pants and boots are perfect! nice look! Perfect harmony of colours, that clutch is beautiful! Veronica, I love how you combined brights with neutral… red, tabac and mint… inspiring !!! Your pictures are so clear and amazing!!! Ok you are very pretty and you know about photography…but what camera are you using?? Thank you for your lovely comment in my blog and good luck with your project. I am following you through bloglovin too!!! I use Olympus E 420 + extra lens 70-300mm and macro 50mm. I love your blazalet. Cute look. 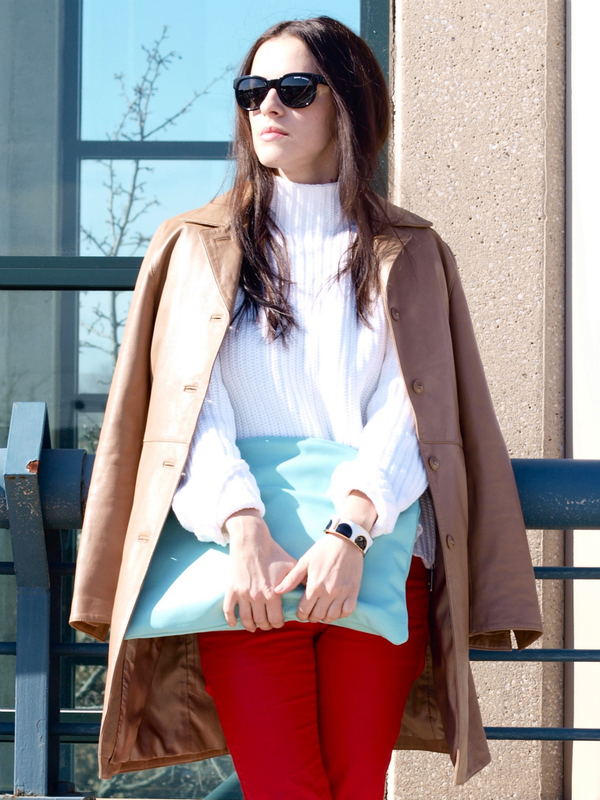 love your clutch’s shape and color! White and red, i really love this combination of colors. I love your clutch too. It’s a perfect outfit as always. Veronica, tu esti frumoasa oricum dar cand te mai vedem cu al tau superb par ondulat?! Combinatia cromatica e excelenta, o sa incerc si verdele fistic cu rosu! Amazing combination of colours! the whole outfit it’s outstanding! Loving the red jeans paired with camel booties, perfect combo! Perfectly clean and stylish look as always! Love your blog, and love your combination of cours. I absolutely love the coolness of the outfit! Love Love Love this loook! Just stumbled on to your blog! How rad!!! We just love it! 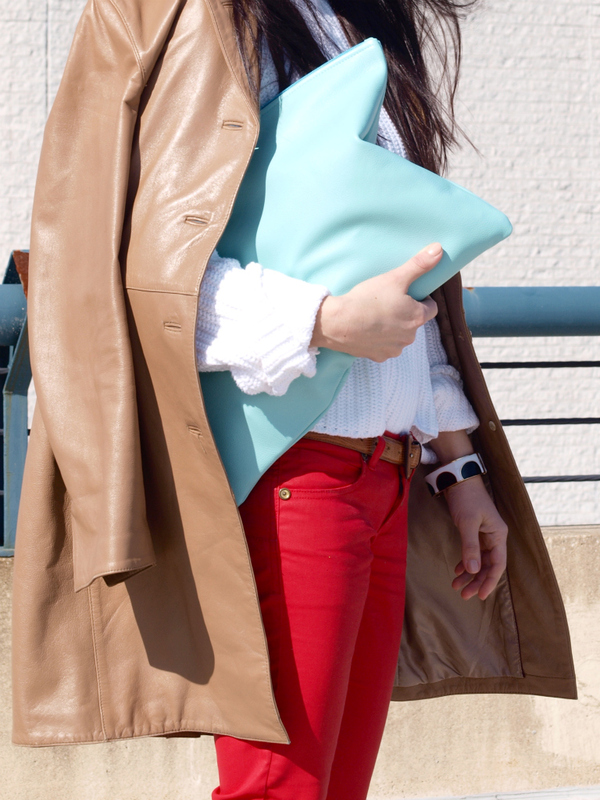 Love your pants and your oversized turquoise clutch! Killin it! I’m really curious about the project…Veronica, this is another perfect simple & chic outfit and the beauty is the details of the great accessories. I didn’t have the occasion to comment on your previous posts, but I found the DIY necklace truly beautiful and so original! That mix of colors looks amazing! 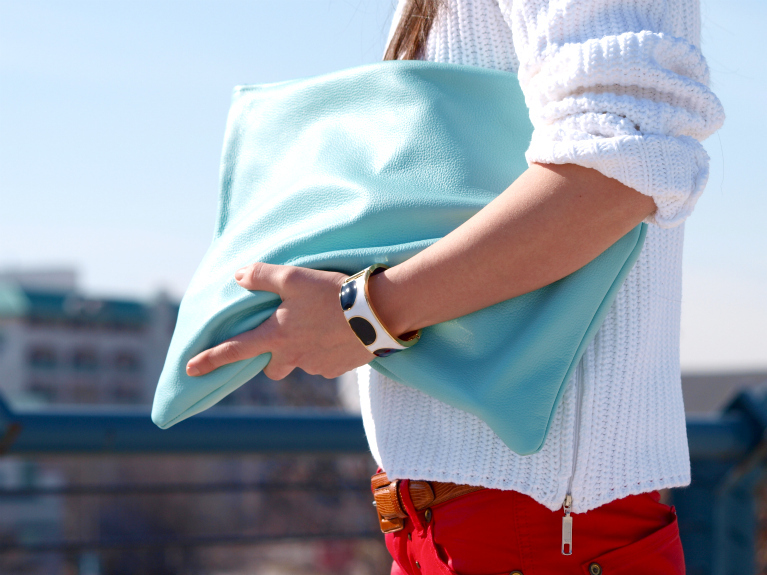 Swooning over the color of the clutch. It looks so good against the red. Perfect outfit!! I love that colours together!!! simply perfect! !